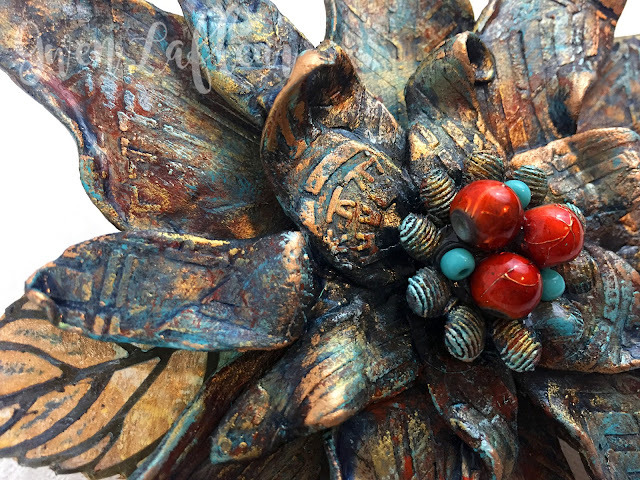 Ready to see how to make your own? 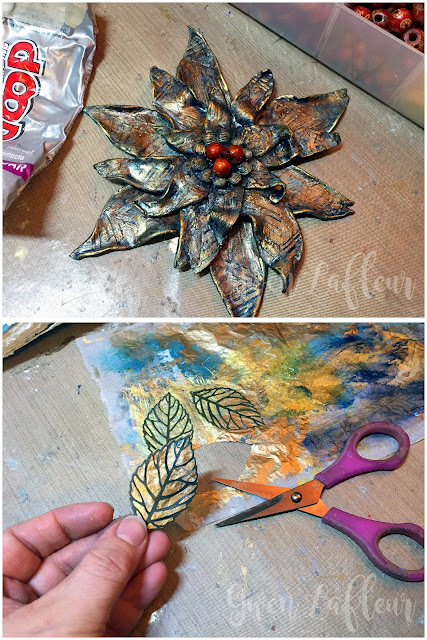 I started with Traci Bautista's Deconstructed Lily Mask and Stencil and just used the stencil part with ink to get the outline of the flower shape onto a piece of cardboard. 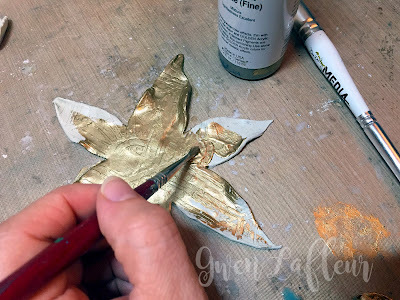 Then I took another sheet of cardboard and laid down the stencil, but I sketched in the outline about 1/4" inside of the actual stencil lines so that I would start to get a graduated shape for my layered flower. I cut out the larger shapes, then I traced the slightly smaller one onto more cardboard and drew another, smaller, flower inside of those lines and cut that out as well. Next, I carefully removed the template from the clay. It can stick a bit - working your palette knife underneath helps get it off. Then I used my finger and some water to smooth out rough patches and edges. 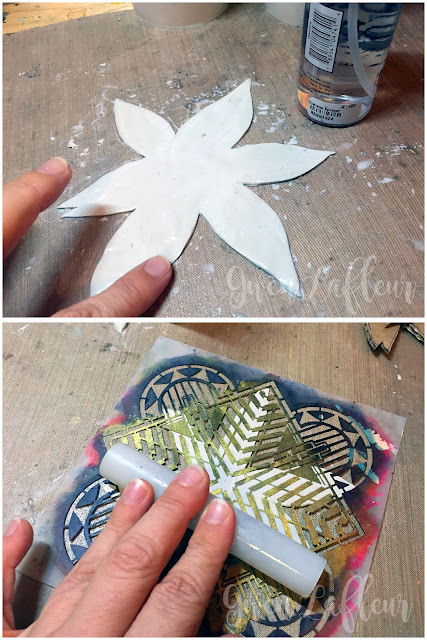 I pulled out my roller and went over the stencil - this can be tricky... you want to roll firmly enough to press it into the design, but not so hard that it gets too embedded. Once I'd impressed the design into the clay, I carefully peeled it off and immediately cleaned any clay off of my stencil with a baby wipe. At this point, I walked away from it for about an hour. 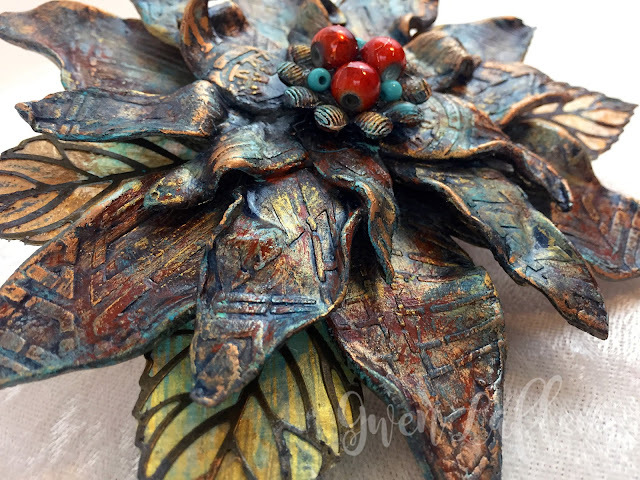 For the next part, I wanted the clay to be able to hold position and detail, and it needs to be no longer water soluble and well on its way to curing for that to happen. 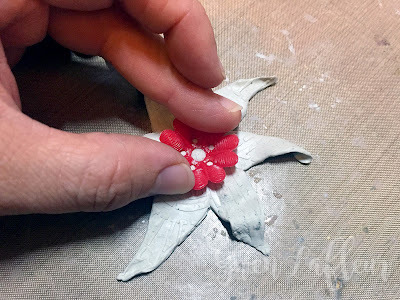 When it got to that point, I started shaping and positioning the petals so they weren't just flat. If you try this yourself, you may want to check it a few times over the following 30-45 minutes to make sure they hold, but then let it continue to cure without any more touching. 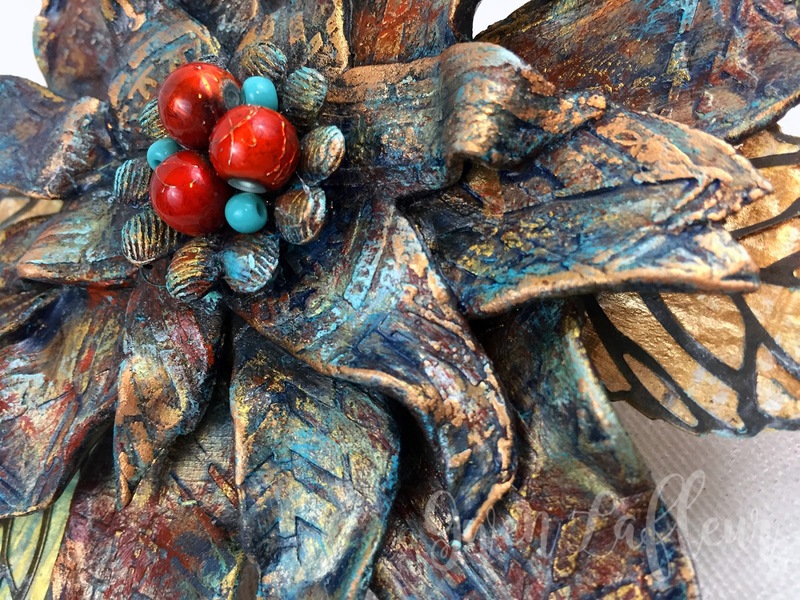 Once it's past the workable stage (usually 2-1/2 to 3 hours,) you can paint it. I started with a base coat of bronze. 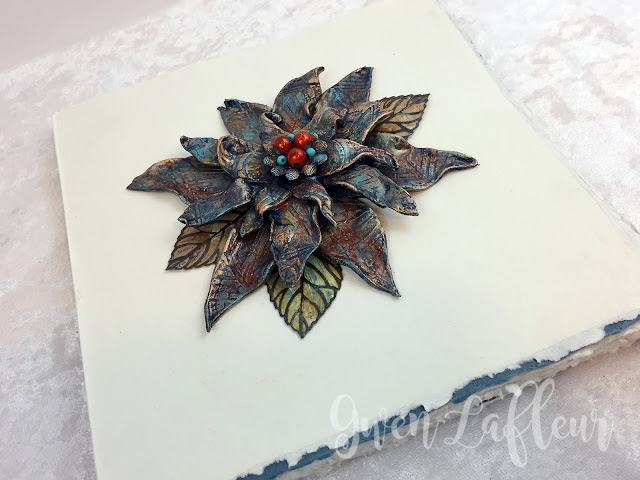 Next, I wanted to start to highlight the pattern and texture from the stenciling, so I used a glaze made from Payne's Gray paint and glazing medium. 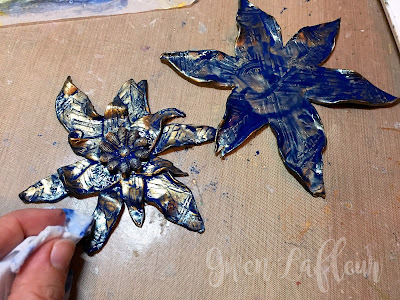 I let the glaze dry for about two minutes and then carefully wiped it back with a baby wipe - just skim the surface, you want the glaze to stay in the crevices and highlight the texture from the stenciling. Once the glaze was dry, I started dry brushing layers of paint, beginning with teal. I kept dry-brushing layers of paint until I liked the way it looked... don't be afraid to throw in a dark layer or two, especially along the edges to add a bit of framing. 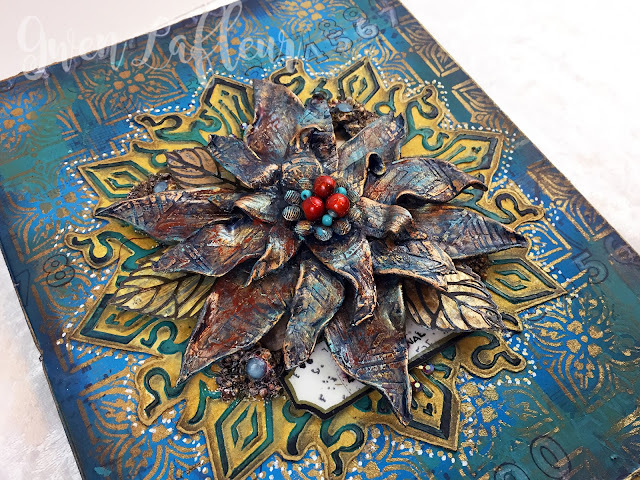 Once the paint was dry, I used some gold wax (I like the Prima wax,) and lightly rubbed it along the edges and surface to pick up the high points and add more emphasis to the texture. Time to put it all together! 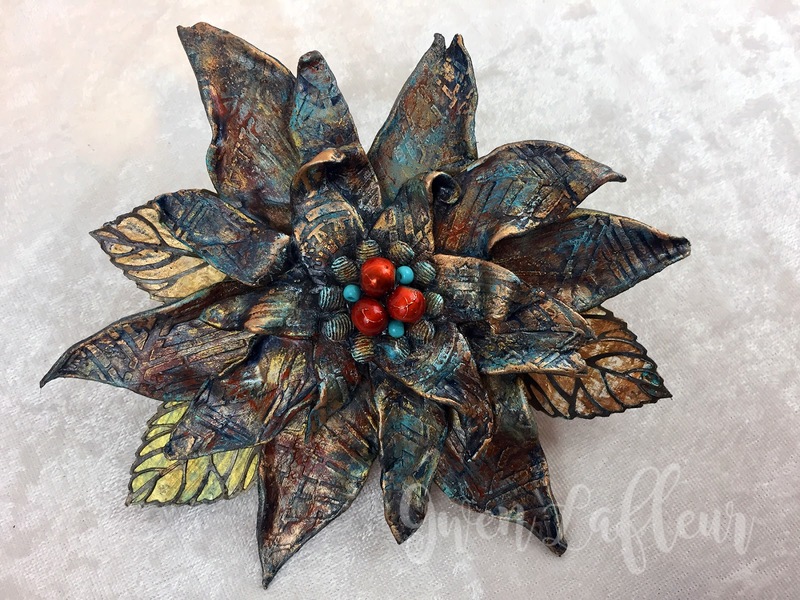 I had connected the top two layers while they were wet so that I could position the petals, but to add the bottom layer I just used more Apoxie Clay. 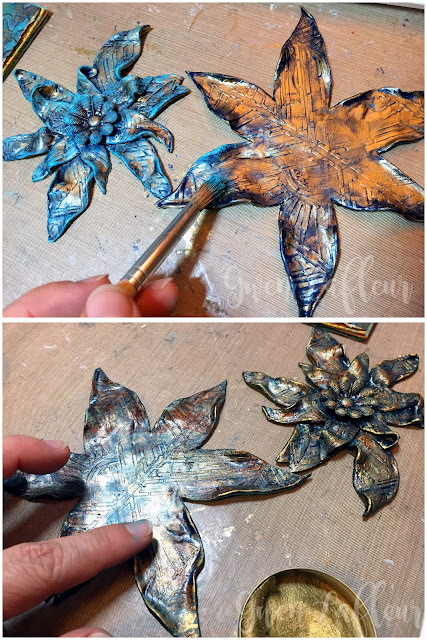 Then I took some metal leaves that were just an outline of the shape and veins and glued them to a sheet of scrap paper with gold and bronze paint on it, then cut them out and glued them to the back of my flower so they would show between some of the petals. First I tried it on a new soft-cover 8x8 art journal / sketchbook I just got (it's full of luscious Indian cotton-rag paper and I can't wait to use it!) I really like it, but I think I'd jazz up the background before completely adhering it. I'm also thinking of making smaller versions to use as pendants for necklaces - wouldn't that be fun? If you make your own clay flower, how will you use it? I hope you enjoyed today's project... happy stenciling! Yes, yes, and yes! Love the flower on last years journal. You never cease to amaze me Gwen. I love your signature style! Thanks Jill! I'm really liking it there too - it may become the permanent home! Thanks Mary! That would definitely be a cool idea for a centerpiece - I might steal it! lol.